1994 Topps Traded Baseball marks the end of the brand's traditional 132-card box set. Released during the 1994 MLB strike, interest was light when it first came out. A light rookie crop has kept 1994 Topps Traded Baseball from being the breakout set many other Topps Traded sets became. 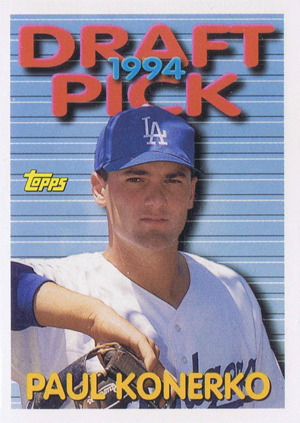 The Paul Konerko rookie card is the best 1994 Topps Traded Baseball has to offer. Other rookies in the set include Jason Schmidt, Rusty Greer, Terrence Long and Ben Grieve. Anatomy of a Trade is a two card subset that looks at the trades that saw Delino DeShields head to the Dodgers for Pedro Martinez, and Deion Sanders and Roberto Kelly switch teams. Ryne Sandberg has a pair of commemorative cards towards the end of the checklist, one showing him on the Phillies and another on the Cubs. Many of the rookie cards have a Draft Picks design. Packaged as a box set, 1994 Topps Traded Baseball maintains the layout found in 1994 Topps Baseball. The main difference is that Traded cards have a 'T' as a part of their numbering. Every 1994 Topps Traded Baseball set comes with eight Finest insert cards. 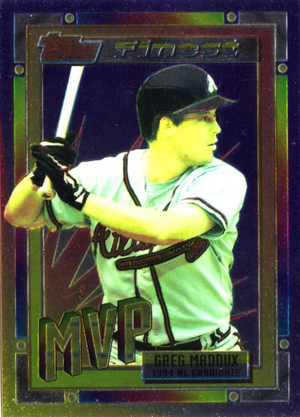 Highlighting the most popular players at the time, each card has either an MVP or Rookie of the Year candidate notation. 1994 - Topps Traded - Ben Grieve - ROOKIE CARD - GRADED MINT 9 by PSA!!! 1994 KEN GRIFFEY JR Topps Traded Finest Inserts #5 PSA 9 mint! 8 cards. One set inserted per 1994 Topps Traded Baseball set.